This February Steven and his xyl Melissa were back at Anse Chastanet. Steve has been a great friend for years and the standing joke when we talk is that I keep a setting at the table for him just in case he shows up eh… well he did show up this time eh..
Anse Chastanet is a long drive to Soufriere, but we did go out there and met up with him and Melissa. We had a lovely lunch right there at the resort, after which we visited for a while at their room. 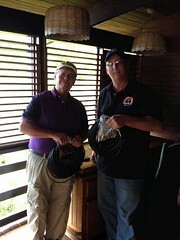 I had asked him to bring down some coax and power poles and pl259’s which he graciously donated. the Coax and a few of the poles were used incidentally at Ian’s place to put up antenna.. that is another page though..
We had a great time and Steve said he would be coming back toward the end of the year again!